The number of gaushalas being built is half the number that was promised by the Congress in its manifesto. Bhopal: A day after the death of 18 cows in country’s first cow sanctuary in Salariya town of Madhya Pradesh’s Agar Malwa district, and following attack by the opposition Bharatiya Janata Party (BJP) over the issue, the Congress government seems to have gone into overdrive. Chief Minister Kamal Nath has announced construction of 1,000 gaushala (cow sheds) in the next four months at the cost of Rs 450 crore, and hike in allowance for cow fodder to gaushalas – from Rs 4.50 to Rs 20 per day. The MP government has also revoked the previous government’s plan to build a golf course on the 100-acre cow grazing land in Bhopal. The decisions were taken during the meeting with animal husbandry department and officials and minister, headed by CM Nath on January 29. To implement it, the district collectors have been asked to identify land for setting up the gaushalas. The areas where cows are seen on roads in large numbers would be given preference. The government claimed that more than one lakh bovine will be given shelter at these gaushalas. After the announcement, the Congress has claimed to have fulfilled one of its poll promises listed in its manifesto. The grand old party had promised to set up cow sheds at all 2,300 panchayats of the state if voted to power, in its manifesto. However, the number of gaushalas being built is half the number that was promised. Following the cows’ deaths, BJP state president Rakesh Singh targeted the ruling party, and said that the death of the cows has exposed Congress’ claim of being a protector of cows and opening gaushalas across the state. “It cannot stop deaths in a sanctuary; how will it take larger welfare steps?” questioned Singh. Later in the day, Ex-BJP MLA from Susner Murlidhar Patidar reached the sanctuary with his supporters. Patidar blamed the laxity of the officials for the deaths, and demanded immediate action by the government. There are about 4,700 cows present in the sanctuary, most of them weak, ill and old. The foundation of this cow sanctuary was laid by RSS Chief Mohan Bhagwat in December 2012 in the presence of the then CM Shivraj Singh Chouhan, but it was formally inaugurated in a low-key affair in September 2017. Now, the million-dollar question is: will the opening of 1,000 cow sheds across the state solve the issue of the stray bovines’ menace? If we rely on the official data, the answer has to be ‘no’. According to the 2012 animal Census, there were 1.96 crore cows in Madhya Pradesh. Of them, 4.37 lakh were stray cattle, of which, 1.50 lakh (mainly stray cattle) were kept in 604 cow sheds run by the NGOs with government’s support, and the rest were unclaimed and abandoned. On the basis of cattle/oxen growth rate, recorded between 2007 to 2012 census, NewsClick has calculated that by 2018, there were likely 1.75 crore bovines in MP, of which, 62.81 lakh were either stray or unproductive. The number of stray bovines has shot up especially since 2014, when the BJP government rose to power at the centre, following its anti-cow slaughter stand and cow vigilantism-related lynchings. Farmers and villagers started abandoning unproductive bovines because they can’t bear the brunt of an unproductive animals. Besides, the number of private gaushalas has increased from 604 to 614 between 2012 and 2018, but the population of cattle (in cow sheds) has drastically fallen from 1.5 lakh to 25,000, according to the Madhya Pradesh Animal Husbandry Department’s official records. So, to keep stray or unproductive cattle/ox in the cow sheds, the government needs to establish about 6,000 gaushalas across the state, which will cost around Rs 27,000 crore. The government has increased fodder allowance from Rs 4.5 to Rs 20 per cow. The step has been taken to encourage NGOs and individuals to set up cow sheds. 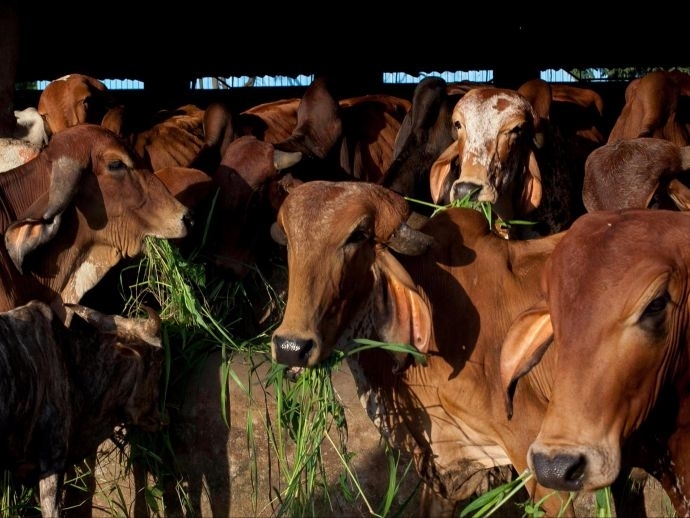 Presently, there are 614 cow sheds, where more than 25,000 bovines are living. The Animal Husbandry Department plans to increase the capacity to 60,000. In next six months, if one lakh cows are given shelter in private cow sheds, the department will pay Rs 20 a day to each cow. Then, every day, the government will spend Rs 20 lakh on cows, Rs 6 crore in a month, and Rs 72 crore every year. But, the issue of stray cattle will still not resolve. “Congress is as good as BJP on cows, which is using cows just to appease the Hindu voters ahead of the general elections,” he added.